Tom Boardley is Executive Vice President and Global Head of Corporate and External Affairs of Lloyd's Register, which provides ship classification services to a large global fleet. Founded in the City of London in 1760, Lloyd's Register works closely with shipbuilders, shipowners and insurers to ensure ships are safe to operate throughout their life. It also provides technical advice to the marine industry on environmental and regulatory matters. Tom joined Lloyd's Register in April 2009 and is responsible for worldwide operations as well as strategy and business development. From July 2012 to July 2013, Tom also took on the Chairmanship of IACS, the International Association of Classification Societies. 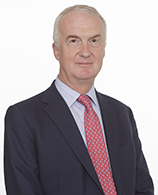 Tom was elected Vice-President of the UK Chamber of Shipping and will serve as President during 2015-2016. Prior to joining Lloyd's Register, Tom had held several senior management positions in the container shipping and ports industry. At the Japanese shipping giant NYK, he had managed the European operations for the container shipping division, including the co-ordination of related activities including inland logistics and supply chain management for major Japanese manufacturers. At P&O Ports, Tom had led business development and acquisitions activity, helping build a global network of container ports that was acquired by Dubai Ports World in 2006. He had also managed the Canadian business post-acquisition, based for a year in Vancouver B.C. For the first 24 years of Tom's career, he was with the container shipping division of P&O, originally trading as OCL and subsequently as P&O Nedlloyd. He held various management roles in the UK, Taiwan, Korea and Japan before being appointed as Director for Australia and New Zealand, based in Sydney, in 1996. Tom is an engineering graduate of Oxford University and is also a fellow of the Royal Institute of Naval Architects.